Designed specifically to do one task, and do it well. 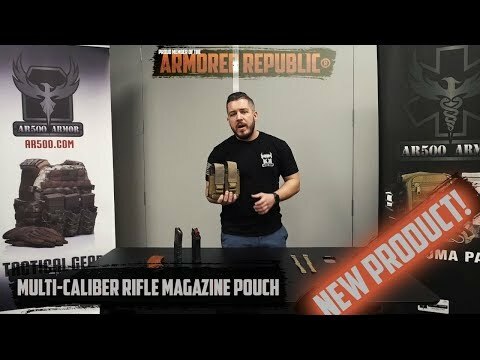 The AR500 Armor® Multi-Rifle Magazine Double Pouch accommodates all common rifle magazines in a single pouch from 5.56x45 (.223), 7.62x39, to 7.62x51 (.308). It’s dual shingle design accommodates up to four (4) small rifle magazines or two (2) large rifle magazines. Front mounted elastic tabs add versatility and additional mounting points for 12 gauge shotgun shells, Tourniquet, Chem-Light, or other horizontally mounted accessories. Constructed from genuine 1000D Cordura Nylon, our pouch features an easy-to-grip Hypalon pull tab. 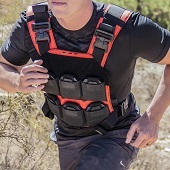 The detachable and removeable retention strap allows you to adjust for magazine capacity size, retention, or run an opened top configuration. Strategically placed elastic retention is the magic behind our Multi-Rifle Mag Pouch. The result is a perfect balance of retention and versatility when running one to four rifle magazines in a variety of calibers. One rifle magazine pouch has never been so functional for the price. Included with each AR500 Armor® Multi-Rifle Magazine Double Pouch is a pair of color matched Fight-Light Malice clips, the premium mounting option for MOLLE accessories and pouches. I like this pouch so far. Attached easily, and securely. Holds 1 Ar10 mag, or 2 AR15 mags per side.